The blue-tongued skink is a large, diurnal lizard, whose appetite for slugs and snails makes it a favorite pet among gardeners in Australia. Skinks are easy-to-care-for, low-maintenance lizards, and make good pets for children and beginners, as long as owners are prepared for their relatively large size compared to other pet lizards. 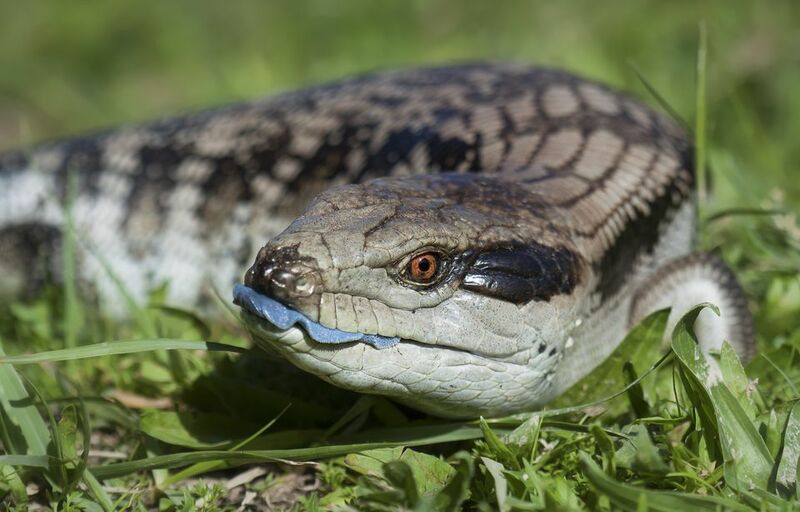 Despite their generally docile nature, blue-tongued skinks will bite if they feel threatened, or hiss and expose their blue tongues (which is where they get their name). Blue-tongued skinks are ground dwellers with a flattened and elongated body somewhat resembling a snake in appearance. They are docile, quiet, gentle, and easily tamed, which is why they make great beginner pets. Native to Australia, these calm pet lizards have distinct blue tongues (which is how they got their name), short legs and dull teeth. In the wild, blue-tongued skinks spend all their time on the ground. Be advised that although skinks are not aggressive, they have strong jaws and teeth, and a bite from a skink can be quite painful. Try to avoid provoking or startling them, and don't let small children interact with a skink without proper supervision. Blue-tongued skinks require a large enclosure, such as a 40- to 55-gallon tank, with a secure lid. The substrate (bedding) can consist of aspen wood shavings, cypress mulch, or even newspaper. Whatever you choose, make sure your skink is not eating it or your lizard could get an intestinal blockage. Provide a large, shallow, and sturdy water dish. Skinks like to bathe in their water but also often defecate there, so frequent cleaning is required for the water dish. Blue-tongued skinks don't need branches for climbing since they are strictly ground dwellers. Provide a couple of sturdy hiding spots since they like to burrow and hide. Cork bark, wood, rocks, PVC pipes, or other hides can be used. Make sure any wood pieces or rocks are firmly placed so they will not fall on the lizard. A humidity hide (such as a plastic storage box with moss or cypress mulch to hold moisture) will help your skink with shedding its skin. Since blue-tongued skinks are native to Australia (just like bearded dragons and frill-necked lizards), temperatures should be warm with a thermal gradient of 75 to 85 degrees Fahrenheit (24 to 29 degrees Celsius) and a basking spot of 95 degrees Fahrenheit (35 degrees Celsius). A combination of under-tank heating and a basking light on one side of the tank works well. Ensure the appropriate temperature gradient is provided by measuring temperatures in various spots around the tank, not just one. Nighttime temperatures can drop to about 70 degrees Fahrenheit (21 degrees Celsius). Cooler temperatures can cause several problems with your skink and make it more prone to getting ill. In addition to the incandescent basking light, provide a full spectrum UVA/UVB light for 10 to 12 hours per day.​ This bulb will have specific instructions on how far away to keep it from your skink but typically it is about 10 to 12 inches. You should also make sure nothing is blocking the light from reaching your skink, with the exception of a metal mesh screen if absolutely necessary. The invisible UVA/UVB rays help with metabolism, bone health, and more. You can feed your skink canned dog food or a pinkie mouse occasionally. Otherwise, stay away from items that aren't fruits, vegetables, or insects. Too much protein isn't good for lizards' digestive systems or kidneys. The most common health problem among skinks (as well as other reptiles) in captivity is metabolic bone disease. This condition occurs when the animal's phosphorous-to-calcium ratio is out of balance, and is usually due to poor UV lighting and sometimes poor diet. Symptoms include weakened or fractured bones, tremors, lethargy, and overall weakness. And like other lizards, skinks can suffer from vitamin A deficiency. A supplement can help prevent this from becoming serious. Reptiles, including lizards, all shed their skins at some point. If your skink isn't able to shed fully, or sheds irregularly, it may be a sign of an underlying health issue. Before you purchase your blue-tongued skink, be sure there's a veterinarian in your area who specializes in exotic pets such as lizards. And while there should be no legal issues with owning this animal, be sure to double-check that it's permissible to have a blue-tongued skink where you live. Try to get your skink from a reputable breeder, who will have the animal's health history available. Your lizard should have clear eyes and skin that is free of blemishes or dry patches (which may indicate a skin condition). If you can watch the animal eat before purchasing, you'll be able to tell if it has a healthy appetite. A lizard that is limping, has any visible deformities, or shows signs of an incomplete shed is probably one with health issues and should be avoided. Otherwise, you can check out these other profiles of reptile and amphibian breeds.